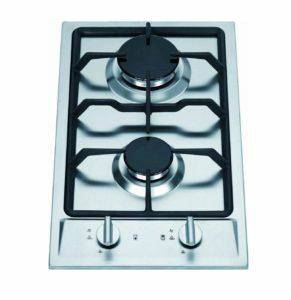 There are three main distinctions while shopping for a 2 burner gas cooktop from that of a full-size cooktop. First, you’ll have very limited choice as compared to shopping for a full-size cooktops. There are fewer contenders manufacturing two burner gas stove owing to lesser demand. Second, the burners are not as powerful as 4/5 burners gas cooktops. Third, they are basic in terms of features. 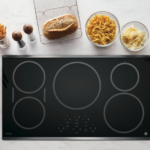 They won’t be anything like the high-end cooktop’s ads we see on the TV. So, who buys a 2 burner stove top? Well, it seems to be a clear favorite amongst people who use these cooktops for small kitchens, RVs, patio, outdoor use, campers, and people looking for portability. We have research and tested many portable gas cooktops, consulted expert reviews and product owners to finally handpicked 5 of the best 2-burner gas cooktop in 2018. 1 Would you prefer drop-in or countertop cooktop? 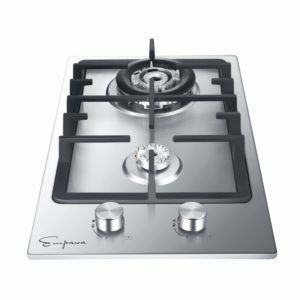 2 What do we look for in a 2 burner gas cooktop? Would you prefer drop-in or countertop cooktop? 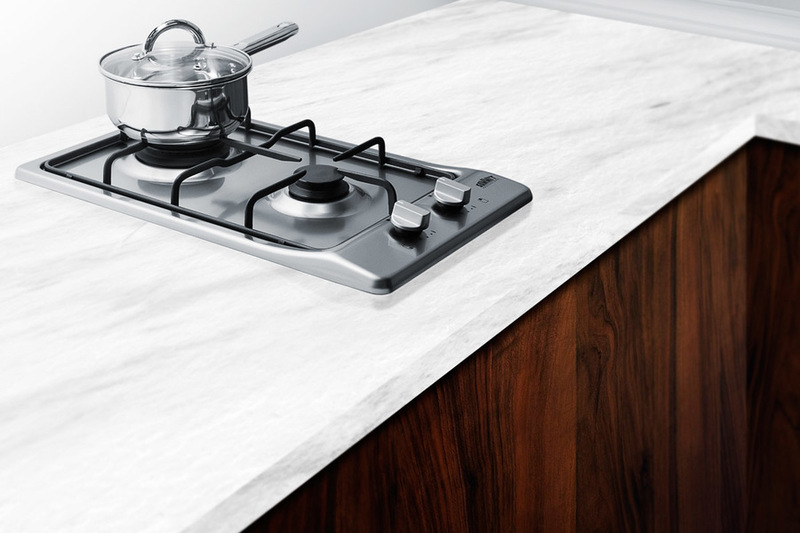 Depending on your requirements, you can choose between drop-in (counter inset) and countertop version. Drop-in cooktops remains fixed on the kitchen counter top, they look trendy and sleek compared to countertop or portable cooktop. Usually, it is easier to clean drop-in cooktops; at least you won’t struggle cleaning underneath the cooktop as often as the countertop model. Just make sure they are easy to install. On the other hand, countertop cooktops are freestanding units, very portable and easy to store away when not in use. They may not be as portable as a single burner unit, yet very practical if portability is your priority. What do we look for in a 2 burner gas cooktop? The power generated by gas stovetops and ovens are measured in BTU (British thermal unit). Typically, the higher the BTU the hotter the gas burner can get. But that doesn’t mean we start looking for BTU we’ll never need. You won’t need the burner strength required in professional kitchens with portable cooktops. If fact, many of you will not even need the burner power of a full-size cooktop. So, what is the ideal burner strength? 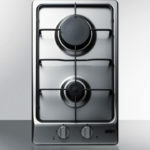 For most users looking to buy a 2 burner gas cooktop, the sweet spot would be between 8500 – 9500 BTU. What is equally important as the burner’s power is equal heat distribution, low heat cooking and simmering. Some burners are designed better to direct heat upward for even and efficient heating. Using correct pans and pots sizes is also important for faster heating and lesser consumption of gas. You can never complete your cooking experience without low temperature burner. You need burners that can handle low temperature cooking consistently which are as important as high BTU heat burners. As mentioned, designs are not just for the looks, the right design makes your overall cooking experience more pleasant and efficient. A well designed cooktop adds efficiency to its burners, makes cleaning easier, move heavy pots and pans with ease while cooking over continuous grates, consume less gas, etc. Needless to say we all want high quality materials. For the cooktop’s surface, you’d want Ceramic glass/stainless steel for easy cleaning and durability, and heavy duty grates for the pot stand. As seen, controls are minimum and simple with most 2 burner gas cooktop. What we expect is responsive controls and where they locate. Getting too close to the cooking areas is a problem while using big pots and pans. 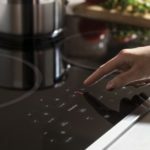 You can’t expect features that are available with full-size cooktops yet some basic features and accessories are expected. 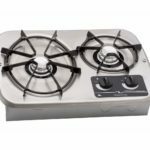 When you buy a gas stove (two burner) lookout for LPG/Propane gas conversion orifice/nozzle while buying a Natural gas ready cooktop, sealed burners, thermocouple, flame out failure detection, Auto shut off gas supply, ETL safety certified products, off-the-grid ability to light up burner with match, etc. 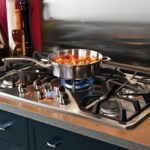 Our number one choice for two burner gas cooktop is from Ramblewood. They have two series available in their latest collections for the 2 burners with two variants each (LPG/Propane and Natural gas) – GC2-43P, GC2-43N, GC2-48P and GC2-48N. There are two primary differences between the two series. The 48 series offers a more powerful burner of 9500 BTU for the top hob as compared to 8400 BTU for the 43 series. The 43 series comes with stainless steel surface while 48 series comes with ceramic glass surface. The choice between stainless steel and ceramic glass top is entirely personal. The burners are quite powerful for both the models. We also like the sealed burners which makes cleaning very easy with these cooktops. The continuous cast iron grates make it easy to slide pots and pans between the two burners. The pot stands are made of heavy duty cast iron. These cooktops are compact, trendy, well designed and sturdily built. These are drop-in units, meant to be dropped into a countertop. 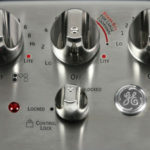 The placements of knobs are separated from the cooking areas, making it easier to control the knobs while cooking or keeping them clean from spillage. On the safety side, these cooktops automatically shut off gas supply when there is flame out. Such incidents can happen when there is spilling from your pots or you forgot to close the nearby windows or doors and the breeze blows out the flame. These cooktops are ETL & cETL(CAN) safety certified for US & Canada and also CE certified for the European Economic Area. You also get one year limited warranty on all the models. 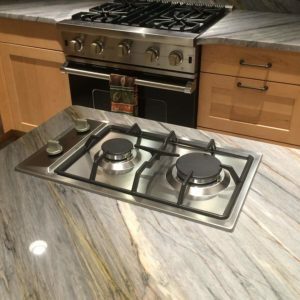 Ramblewood cooktops are reliable and sturdy, the one major flaw with these cooktops is the elbow connector which get loosens over time. Make sure to use an extra bracket to give the extra grip. We would also like to see metal knobs with their next upgrade, as of now they offer temperature resistant plastic knobs. Adjusting the burner’s flame could have been easier. 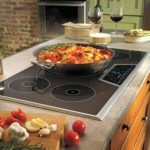 These are great cooktops and one of the best in its class. These cooktops are well built with heavy cast iron grates and looks very trendy. If you are worried about the durability of ceramic glass surface you can opt for the stainless steel model, the difference of 1000 BTU is not much to be missing something big. There are few glitches with these cooktops but nothing major to overlook the fine craftsmanship and value for money it offers. Are you a fan of Italian products? 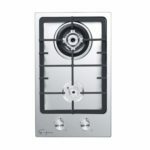 If so, this Summit GC22ss two burner gas stove will surely impress you. Summit Appliance did a great job to offer this deluxe line of portable gas cooktop with flawless design, compact yet powerful, an appliance that will definitely add charisma to your modern kitchens. It is UL (Underwriters Laboratories) listed product for the U.S and Canada. The continuous cast iron grates makes sliding pots between the burners easy. The stainless steel surface features a unique curve design on all the edges which looks striking. Summit GC22SS comes preset for natural gas operation but with the LPG/Propane conversion kit you’re good to go for LP gas too. With the thermocouple flame failure protection, if flame gets extinguished the burner gets automatically turns off in 12 seconds. You can use this cooktop as a freestanding unit or as counter inset. Much like any other portable gas cooktop, it’s hard to accommodate two large pans and pots. Although it comes with a conversion kit from Natural gas to LPG, installation would be easier if they have different models for LPG and Natural gas. We recommend this cooktop for its powerful burners, steady simmering, classy looks and safety feature. The Summit GC22SS gas stove is an ideal choice for any fancy and small kitchens. Empava is relatively a new company established 2 – 3 years ago but getting due recognition for its dedication to manufacture home appliances using cutting edge technology, modern design innovations and eco-friendly at a competitive price. Don’t compromise quality for price is what they always says, and looks like they mean it. Folks who like powerful portable cooktops should consider Empava EMPV-12GC010. The rear burner features triple ring burner of 11942 BTU and the front burner 3412 BTU. They also use sealed SABAF burners imported from Italy. The unit is factory set for Natural gas but includes LP gas conversion kit. The body is made of stainless steel, and the continuous cast iron grates and knobs are dishwasher safe. It’s easy to clean. 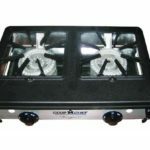 Features such as flame failure safety, electric ignition, LPG conversion kit, 100% 18 gauge stainless steel panel, all these and more comes with this reasonably priced cooktop. Just like any new and small companies they still have many tests and trails to do. Some customers complained of receiving defective unit right out of the box. Based on value and impression the Empava 2 burner stovetop definitely earns our high recommendation. 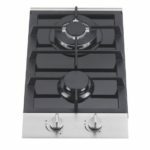 In fact, we think this is the best valued 2 burner gas cooktop in the present market. The list will not be completed without the conventionally designed Camp Chef Ranger II Blind Stove, a freestanding unit. Almost every house use to have this traditionally designed cooktop at one point of time. It is simple, straight forward and easy to install. 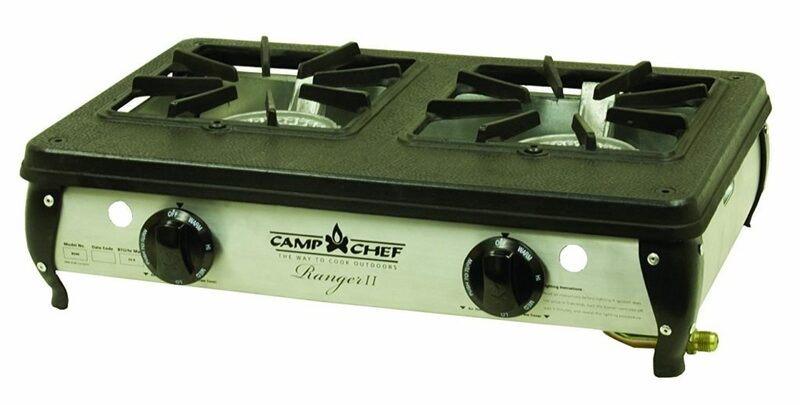 This cooktop is an ideal choice for campers and outdoor use. The body is made of cast-aluminum with cast iron grates and burner housing that blocks the wind. This cooktop feels very sturdy, is light weighted and very portable. I really like the burners. Each burner features 17,000 BTU (Total output of 34,000 BTU), the most powerful burner among all cooktops we have reviewed here. Self ignition is a nice feature. You don’t have to worry carrying a matchbox with you for your camping. This cooktop use a low pressure regulator, which means if your trailer or RV is only pump for low pressure gas you can plug-in and start using directly. 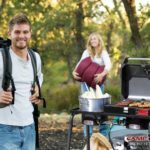 If cooking outdoor is something you’re considering, we highly recommend Camp Chef Explorer 2x stove. Its a complete package for outdoor cooking. Simmering is a problem with this cooktop. The burners are powerful yet controlling is an issue. Though it comes with burner housing you’ll still need stove windshield to use it effectively in a windy environment. It’s not just us, this cooktop is highly recommended by users worldwide. You can read what they have to say here. Camp Chef Ranger II Blind Stove is well built and works great. It can be better than your average cook stove for an investment of less than $100. This one is one mean cooking machine, we love it. What if the cooking space is really tight? If that is the scenario with your cooking space, the best solution would be Atwood 56494 DV 20S cooktop. 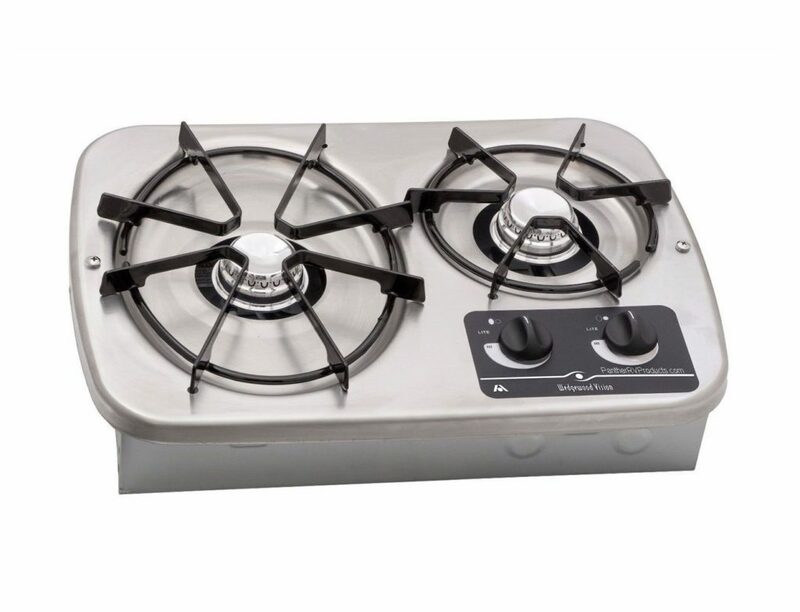 This small stovetop is a favorite choice among RV and Boat owners. Don’t let the size mislead you, it’s quite powerful and will do your cooking just fast enough. The larger burner features 7,200 BTU and the smaller one 5,200 BTU. The product dimension is 15.8 x 18.9 x 7.1 inches with a cutout of 11.25 x 16 x 2.75 inches. The grates are especially design for moving RVs and Boats, rattle free once installed. You need to squeeze the open sides of the grates to fit into the body. There is no electric ignition and support only match-light ignition to turn-on the stove. It lacks basic features such as auto shut-off and electric ignition. Installation is simple, yet some of you would need an extra gas hose with an additional regulator depending on the gas connection type. You’ll love this little cooktop if extreme portability is what you want. There is nothing to awe about but this cooktop is certainly functional and serves the purpose well. It is a basic cooktop and good for the money. Cooktophunter.com is a participant in the Amazon Services LLC Associates Program, an affiliate advertising program designed to provide a means for website owners/webmasters to earn advertising fees by advertising and linking to amazon.com, endless.com, smallparts.com, myhabit.com, and any other website that may be affiliated with Amazon Service LLC Associates Program.